At the Bedford Autodrome Running Grand Prix DANNY SUTTON completed his 2nd marathon in a new PB of 3:53:10 – a massive 70 minute improvement over his first in London in the spring. He finished 18th of 42 men. The conditions were great and he gritted his teeth to get the exact time he was aiming for! VERITY FISHER completed 10km at the same event in a year’s best of 48:59 with negative splits so was really happy with her time, finishing as 16th lady out of 135. ROWENA RUTLEDGE finished in 57.08 with KYM MARTIN finishing in 1:09:04. Sixty-six Spartans ran in the Standalone 10k, which this year incorporated the county veteran’s championships. Individual county prizes were won by JULIE SIMMONS (gold in VW55 category) and YUKO GORDON (gold in VW 65 in a season’s best time) for the women. For the men, DAVID BOWKER was third finisher and county bronze medalist in the VM60 category in a season’s best and PETER CARPENTER 4th finisher in the VM70 category, but with one non-Herts runner in front he secured county bronze in a season’s best time. 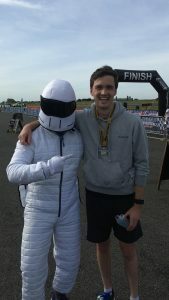 The race traditionally provides a host of personal achievements for Spartans and this year was no different. 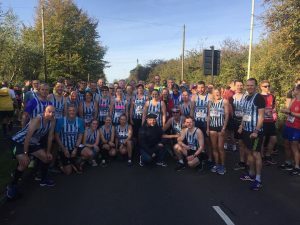 There were new personal bests for DANNY SCANLON, JAMES KAY, MARIE COLUCCI, CLAIRE EMMERSON, ANDREW SMITH, NEIL ROBINSON, LEE PICKERSGILL (his second of the week), NEAL MUGGLETON, CAROLE SHELDRICK, SAM SIMMONS, LIZ SMITH, STEVEN DOBNER, ALISON SHELLEY, SHERY HANN, SOPHOCLES GEORGIOU, SALLY PHILLIPS and WAYNE McMILLAN. Additionally there were season’s best times for MATTHEW GILL, DARREN EMMERSION, MARTIN DUDLEY, STEPHEN PIKE, SARAH PIKE, KAREN PALMER, MONICA SMITHSON, ANTON McCALLA, LIZ CARVELL, TRACY STILES and CHLOE EMMERSON. Also year’s best times for MIKE GREEN, KEN JUDE, JOHN NELMS and KELLY CHAPMAN. Finally it was tremendous to see a number of Spartans running their first 10k race with the club, including ADAM JENKINS, MATTHEW PATTMAN, HOLLY ARCHER, TAHER THARANI, NICOLA HATHERLEY and NIKI PLUMB, all setting new baseline PBs to work on improving going forward! A full table of Spartans results and times can be found towards the end of this release. TIM SABAN ran the Chester marathon in a chip time of 3:24:36. Tim reported afterwards “I found the hills a little tough towards the end. But I enjoyed it nevertheless. It was a year’s best and course record by 6 mins on previous attempts”. Also taking in the road trip to Chester’s Roodee was ERICA GRAYSON who ran in the metric marathon, a 26.2k race. She was happy with her time after down-trading from the full marathon after a cold and life meant her training had not gone to plan. HELEN WHITEHURST reported she was happy with her time of 2:13:19 at the Oxford Half Marathon. Her goal was to complete without walking, and in a time of sub 2:30, which achieved in some style. The runners at the event have yet to receive medals, as they got caught in storm Ali had not cleared customs in time for the race! JIM BROWN and PENNY SCHENKEL continued their exploits in the southern hemisphere on New Zealand’s South Island. Jim ran the Half Marathon, and won the Men’s Vet 60 category in a time of 1:48:27, finishing 54th overall. The race was run down a hill and then run back to Mount Cook Village with a brutal finish. Penny celebrated her birthday by winning the Women’s 40 plus category in the 5k by a wide margin in 28:26. HAZEL JONES ran the 10K at the festival and completed in a new PB of 01:14:45. SHELBE MOONBEAM also notched a new PB in the race. In a solo outing she showed determination to complete in 1:02:09, knocking over 5 minutes off her previous PB set in Regents Park a month ago. Kempton Park is the scene of many memorable chases over the years as Desert Orchid, The Fellow, One Man and Kauto Star won one one of racing’s greatest prizes multiple times. But this week it was the scene of a new “chase”, a 10k event. KAREN and TREVOR BROOM travelled to Sunbury for the first running. Karen reported: “it’s a completely flat course around the racecourse. You choose to run a half marathon 10k or a 5k depending on how many laps you want to run. Trevor ran the 5k and finished in 30:42. I ran the 10k which was 2 laps, and was so happy with not only a 10k PB by a minute, I also got my first sub 60 10k finishing in 59:30. She completed the race in 3:08:15. It was the final race of the Hatfield 5k series on Wednesday night, in much calmer conditions than the middle event was run in. GRANT RAMSAY was the fastest Spartan finishing 6th in 17:06. 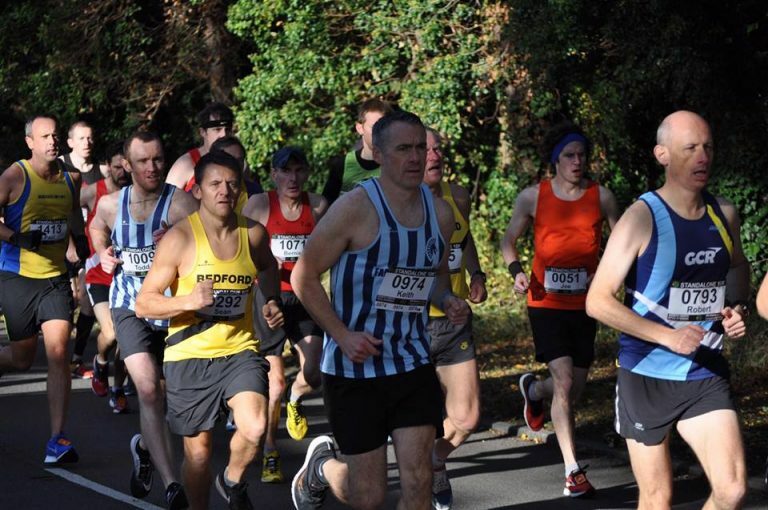 CHRIS HOLLAND was next, smashing his PB by 29 seconds to set a new mark of 21:21. YUKO GORDON was first in her category in 21:52, while MICHAEL ANDREWS was fourth Spartan finisher in 22:27. KEN JUDE ran 20 seconds quicker than race 2 to set a new Year’s Best of 22:55 and LEE PICKERSGILL set a new PB of 23:05. A full table of results can be found towards the end of this release. On the weekend that Parkrun celebrated its 14th birthday Stuart HAYCROFT was first at Stevenage Parkrun in 18:26. Ashley SCHOENWETTER was first female and fourth overall at Barclay in a time of 21:22. There were course PBs for John ROXBOROUGH at Heartwood Forest, Michelle MARCHANT in St Albans and Karen ELLLIS in her 4th Parkrun in Stevenage. Standalone 10k – Sun 7/10/18 Notes Gun PB Chip Pos Impr.